Did you ever wonder what New York’s Times Square would look like without the huge outdoor ads? Or for that matter, L.A. Live or Hollywood Blvd? 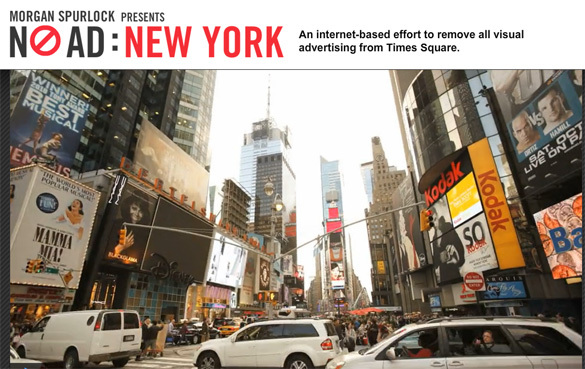 An ad-free environment in those two L.A. spaces has to be left to the imagination, but now, thanks to filmmaker Morgan Spurlock, you can take a virtual trip to Times Square and strip the building facades of all those glittery sales pitches for products and services. Spurlock, best known for his film “Supersize Me” in which subsisted for 30 days on a diet of nothing but McDonald’s fast food, has created “NoAd: New York” where internet users can choose various frames of a panoramic shot of Times Square and then use a Photoshop-style editor to remove the ads and replace them with approximations of the building facades. According to Spurlock, this effort was inspired by Sao Paulo, Brazil, where the city’s mayor imposed a ban on all outdoor advertising and forced the removal of existing billboards and other advertising signs cluttering the city’s streets. The website includes a contact link for users who want a NoAd effort in other cities. So maybe people will soon be able to virtually remove those multi-story supergraphic and electronic ads that dominate Hollywood Blvd., or the billboards that clutter major thoroughfares throughout the city. We’re planning to try our hand at erasing the signs from one of the Times Square vistas. Stay tuned for the results.